When I was a kid, a typical Easter Sunday featured an Easter egg hunt after church and a feast with family and friends. As an adult, I may seem satisfied to watch the annual egg hunts from the sidelines, but in reality, I regret missing out on the fun. If you feel the same way, I have some great news — adult Easter egg hunts are a real thing! The City of College Station’s Parks and Recreation Department has revamped our traditional egg hunt and created one just for grown-ups 18 years and older — and it’s even glow-in-the-dark. 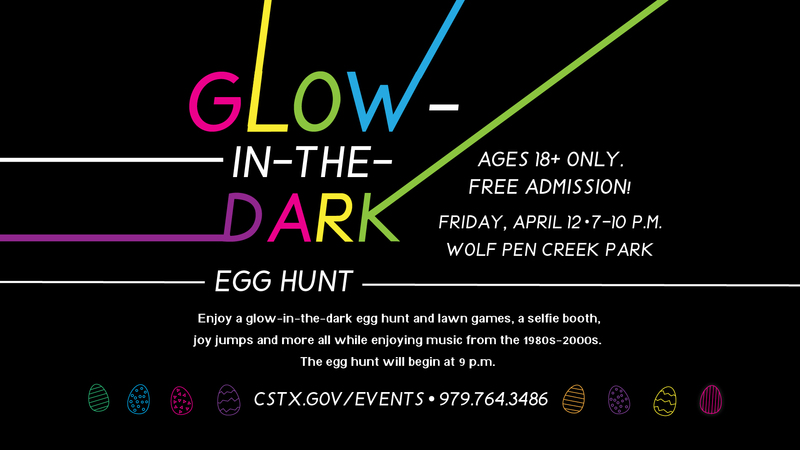 We invite you to join us on Friday, April 12 from 7-10 p.m. for the Glow-in-the-Dark Egg Hunt at Wolf Pen Creek Park. The nostalgic atmosphere will help you relive your fond childhood memories with tunes from the 80s, 90s, and 00s to awake the adolescent in you. We’ll have games, joy jumps, and face painting with a touch of the trending selfie booth to document your experience. The egg hunt begins at 9 p.m.
Last year, the parks staff wasn’t sure about what to expect as we strategically hid 10,000 eggs. Our worst-case scenario was if 1,000 attendees showed up, they’d each get 10 eggs. We didn’t realize more than 2,000 adult residents had so sorely missed the Easter egg hunts of the childhood. We never dreamed we’d have that level of participation for a first-time event. We planned to hide the eggs throughout the park to spread out the savage hunters. For the most part, the strategy fell flat, but the feedback we received helped us to evaluate and analyze the event effectively. We went back to the drawing board. This year’s egg hunt will be different. We have doubled our inventory to 20,000 eggs, which include 20 golden eggs that contain prizes from local businesses. In addition, the entire hunt will be on the Festival Site near the old Arts Council building. Our staff of egg protectors will make sure sneaky hunters don’t pilfer any eggs before the hunt begins! Stay out of the hunt zone until the coordinators officially start the hunt. Keep your hands, feet, and body to yourself. Hitting, kicking, tripping, pushing, body slamming or other forms of physical harm to others will not be tolerated. Don’t miss out on all the mad fun. It’ll be all that and a bag of chips! For more information, visit cstx.gov/events or call 979-764-3486. Virginia Godwin is in her fifth year as recreation supervisor. A College Station native, she previously served as the staff development specialist for Kids’ Klub, the College Station Independent School District’s after-school program.